Dr. Kim was surgically trained in New York City rotating through several busy hospitals including; Wyckoff Heights Medical Center, Richmond University Medical Center, Long Island Jewish Hospital, and Gramercy Surgical Center. 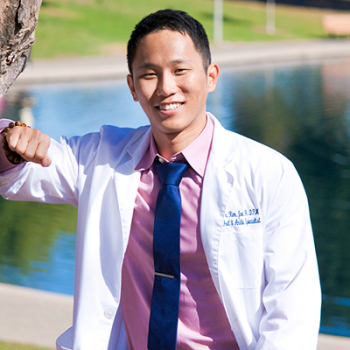 Dr. Kim is an attending physician at El Camino Hospital of Silicon Valley where he performs elective surgeries and take calls from Emergency Department at the hospital. Dr. Kim has specialized in treating major foot trauma, elective foot surgery, pediatric podiatry, podiatric dermatology and diabetic limb salvage. Dr. Kim speaks English and Korean Fluently. Dr. Kim really believes that the best way to treat patients is by educating the patient and going through a step by step treatment. He believes in doing what is best for the patient and will always work with the patient to provide better health care. Dr. Morgan is originally from northern Illinois and has a diverse background and varied interests in music performance, extreme sports and traveling. Dr. Morgan is an all around podiatrist with qualifications in all aspects of pediatric evaluation and management. This is ranging from heel pain to surgical foot and ankle reconstruction. Dr. Morgan recently completed on of the most rigorous residency programs in the country at the University of Texas. He received advanced training in all pediatric medical and surgical modalities specializing in forefoot and rear foot reconstruction. In his spare time Dr. Morgan enjoys surfing, distance running, cycling, skiing, sailing, chess, blues guitar, and reading about new innovations in medicine and surgery. Dr. Dupont grew up in upstate New York and was a Respiratory therapist before completing his doctorate in Podiatric Medicine in Philadelphia. He completed a three year residency in foot and ankle reconstruction with extensive training in wound care, diabetic limb salvage, and elective surgery before entering private practice in Maryland. He has experience treating all manner of foot and ankle problems including fractures, sports injuries, skin and nail disorders, heel pain, bunions, nerve problems, and diabetic foot care. Dr. Dupont recently relocated to the Bay Area and is excited to provide his expertise to the local community. He will take the time to explain the problem to you and provide multiple treatment options to best suit your needs. His goal is to get you back on your feet and pain free as quickly as possible.